1857, United States. 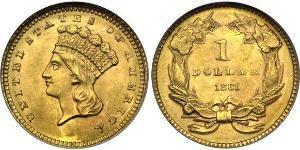 Beautiful Gold "Indian Head" Dollar Coin. (1.67gm) XF-AU! Reverse: Value (1), denomination (DOLLAR) and date (1857) within wreath. 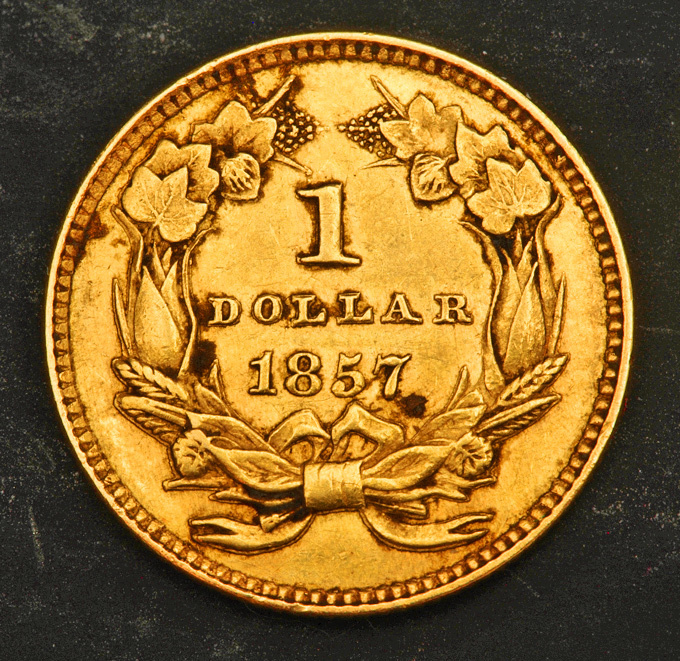 The gold dollar or gold one-dollar piece was a coin struck as a regular issue by the United States Bureau of the Mint from 1849 to 1889. The coin had three types over its lifetime, all designed by Mint Chief Engraver James B. Longacre. 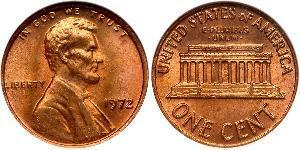 In terms of diameter, the Type 1 issue was the smallest United States coin ever minted. 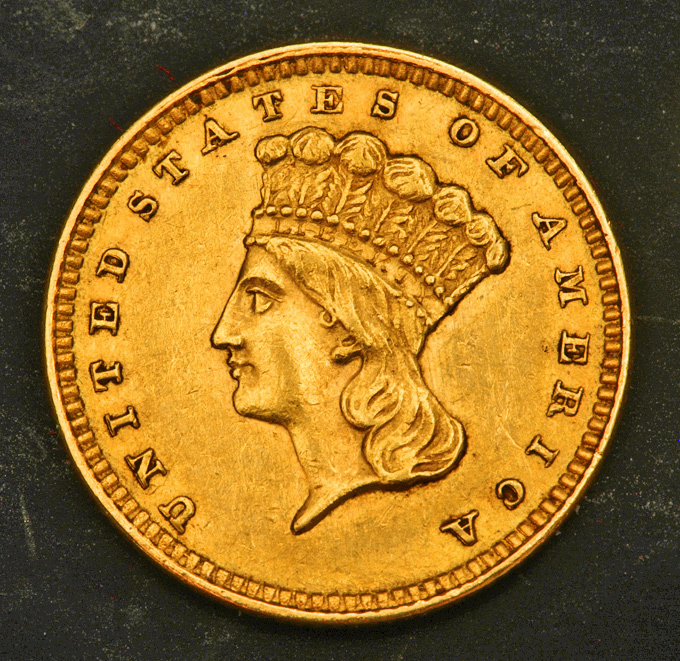 A gold dollar had been proposed several times in the 1830s and 1840s, but was not initially adopted. Congress was finally galvanized into action by the increased supply of bullion caused by the California gold rush, and in 1849 authorized a gold dollar. 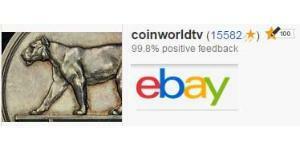 In its early years, silver coins were being hoarded or exported, and the gold dollar found a ready place in commerce. 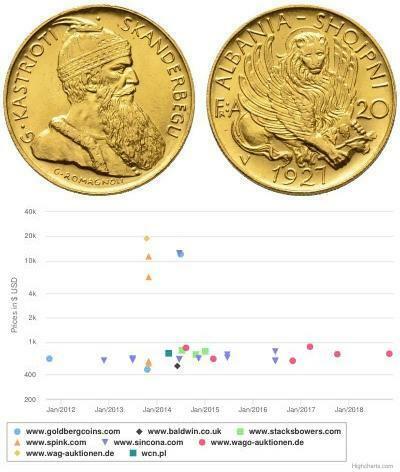 Silver again circulated after Congress in 1853 required that new coins of that metal be made lighter, and the gold dollar became a rarity in commerce even before federal coins vanished from circulation because of the economic disruption caused by the American Civil War. The Type 2 and 3 gold dollars depict Liberty as a Native American princess, with a fanciful feathered headdress not resembling any worn by any Indian tribe. This image is an inexact copy of the design Longacre had made for the three-dollar piece, and is one of a number of versions of Liberty Longacre created based on the Venus Accroupie or Crouching Venus, a sculpture then on display in a Philadelphia museum. For the reverse, Longacre adapted the "agricultural wreath" he had created for the reverse of the three-dollar piece, composed of cotton, corn, tobacco, and wheat, blending the produce of North and South. This wreath would appear, later in the 1850s, on the Flying Eagle cent. 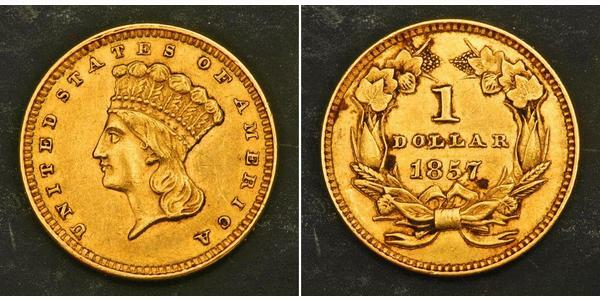 Art historian Cornelius Vermeule deprecated the Indian princess design used by Longacre for the obverses of the Types 2 and 3 gold dollar, and for the three-dollar piece, "the 'princess' of the gold coins is a banknote engraver's elegant version of folk art of the 1850s. The plumes or feathers are more like the crest of the Prince of Wales than anything that saw the Western frontiers, save perhaps on a music hall beauty."